SLATE Feel Good Vintage Fair is coming to Armley | West Leeds Dispatch | News. Views. Get involved! Yes, that’s right! 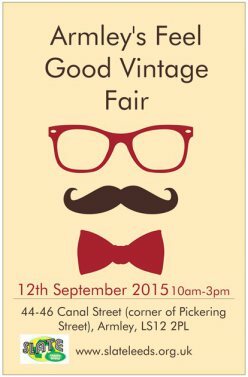 SLATE’s third Vintage fair will be hosted by our Armley Feel Good Furniture Shop. SLATE is a Leeds-based charity that has adults with learning disabilities right at the heart of its organisation. We provide real life experiences, work and social opportunities; all while saving your unwanted ‘stuff’ from landfill. We have shops in Hunslet and Armley and our cafe in Beeston. We’ve already had three successful fairs in Beeston including 2 vintage fairs and now we are coming to Armley! Stall applicants please email: info@armleyvintagefair.org.uk.